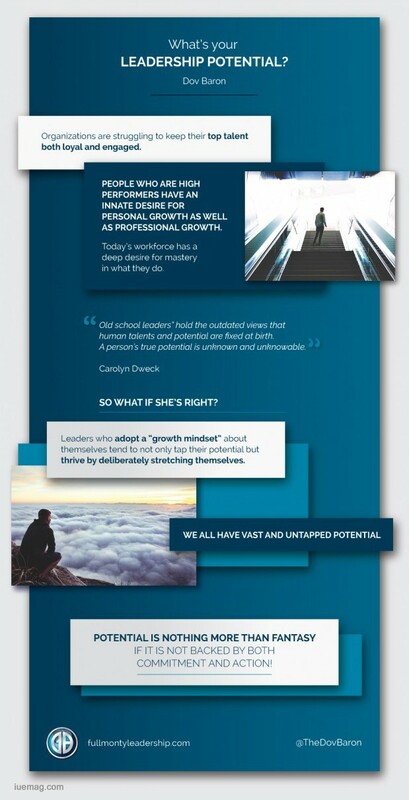 One of the ways you will know that you are a high performing individual is that you will have an innate desire for personal growth as well as professional growth, here's why: Today's workforce has a deep desire for mastery in what they do. One of the reasons, so many organizations are struggling to keep their top talent both loyal and engaged is because of the natural evolution of high-performance individuals. Today’s top talent want to maximize their human potential, Sadly, many organizations and leaders are at best routinely giving lip service to these needs, or at worst completely ignoring them all together. Carolyn Dweck, a Stanford University psychologist and author of the groundbreaking book “Mindset: The New Psychology Of Success,” says that she has 20 years of compelling research that proves that a limited belief in human potential–a “fixed mindset”–profoundly restrains our success as leaders. “Old school leaders” hold the outdated views that human talents and potential are fixed at birth or that somehow an IQ score tells the whole story with regard to the capabilities of a person.” However, Dweck’s research categorically refutes these ideas. So often we will only look at what is apparent and presently obvious, rather than the process by which someone achieved their position. In other words, instead of making assumptions, we need to being willing to ask ourselves and our teams “What was their process of fulfilling their potential to the level they have?” Does this make sense to you? According to Dweck, “a person’s true potential is unknown and unknowable. It’s impossible to foresee what can be accomplished with years of passion, toil, and training.” As a result, she urges us to adopt what she calls a “growth mindset.” She suggests that we develop a belief that anyone’s basic qualities can be nurtured, cultivated and grown significantly through committed effort. So what if she’s right? Well, the research shows that leaders who adopt a “growth mindset”about themselves tend to not only tap their potential but thrive by deliberately stretching themselves. Moreover, having a “growth mindset” expands that leader’s view of each individual they lead. In turn, this creates the space for that individual to step into a greater amount of their potential. Just for a moment allow yourself to stop and consider; anything you had a deep desire to be good at, you were once not very good at. In fact you may have started out being pretty terrible. Let me put it another way, and to put a none to blunt an edge on it: At some point, you weren’t good at something, but you wanted to be. Maybe it was a desire to play a musical instrument or run a marathon. Whatever it is, the very first time you attempted it, you weren’t a master, Not even if you were a child prodigy. At the beginning, you may even have been a bit of a fumbling fool. No one starts out from a place of accomplishment, but rather what makes us masterful is our deep and burning desire to become masterful and accomplished. If you followed your deep desire with commitment to do whatever it took to become good at 'it', there a very good chance that you learned to not only be good, but to fulfill an unknown potential and potentially become excellent. We all have vast and untapped potential; however, if we measure our intelligence by our ability to do things we have no real interest in, then we may all be seen as fools in any particular context. Let me give you an example. I’m not particularly interested in professional baseball. So if you were to measure my intelligence by how well I’ve mastered the ins and outs of the rules of baseball or if I can tell you the rankings of teams, I would come up short. You might even conclude that I am a bit slow; certainly not baseball leadership material. But if you were to ask me about something that I am interested in, passionate about, the result would be very different. Whether you like it or not; if you are a leader who is committed to generating fierce loyalty it is incumbent upon you to create an environment facilitates the fulfillment of potential. Just as clearly; you must be equally committed to get people out of your environment (Corporate culture) who are Not committed to stepping up, growing and fulfilling the potential they haven’t yet realized. Potential is nothing more than fantasy if it is not backed by both commitment and action! - Where have you (actively or passively) boxed in the potential of those you lead? - How might you better assist your people in fulfilling their unknown potential through their personal and professional development? Bottom line: Leadership development can no longer be separated from personal development. Do what you must to have your people find their own genius and you will do more than you can possibly imagine toward developing fiercely loyal followers who are themselves leaders. A headline speaker for global conferences on leadership, influence and more.